Redesign your Ecommerce Website with Brick - Start Now! Making sure your website stays modern, current and dynamic is absolutely essential to retain visitors, who become more discerning by the day. Here are five reasons to invest in a redesign and relaunch of your internet presence. 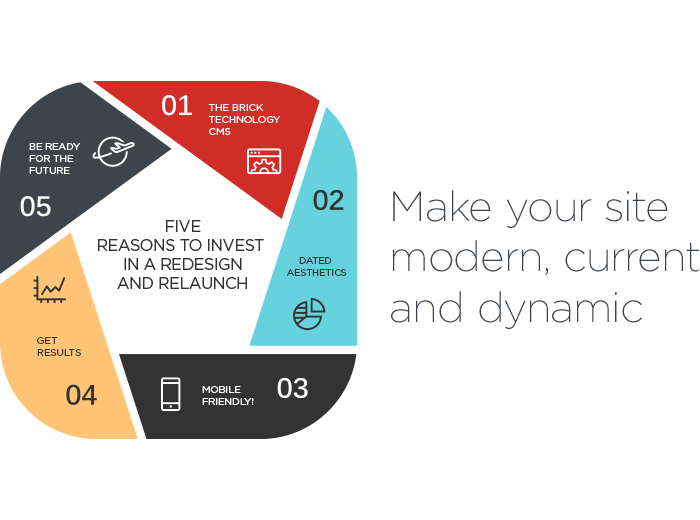 Throughout the rapid progressing of internet technology, Brick have kept up with the pace and have continued to offer the most flexible, powerful features from our CMS. Security is always a prime concern and our progressive, custom-built CMS is designed to be safe, adaptive and effective. An outdated CMS means a less efficient web presence. Plenty of research has shown that the first impressions of a website visitor count for everything and, if enough value is not immediately conveyed, engagement is broken. Take a look at some of our websites and notice the sleek, professional feel each one has — this reflects on the profes­si­onalism of the company as a whole and inspires the website visitor with confidence. Your website MUST be optimised to operate across a range of devices. Frustration with accessibility has driven the development of mobile web design and Brick technology can create a website that meets all the modern demands. Google will soon be including mobile-friendliness as a ranking signal. In order to achieve desired results, it is first important to specify what you want these results to be. Working closely with a digital agency such as Brick technology will allow you to clearly define objectives and measure progress in their achievement. Improving online opportunities will happen naturally as these objectives are worked towards and met. The goals of a business change with time and an ecommerce website from Brick technology is designed to support such changes. To thrive in the expanding internet, businesses need to choose a digital agency with a reputation for evolution who can constantly optimise and enhance your new ecommerce website with contemporary mobile web design. Contact Brick technology today to find out how our web development techniques could change your businesses forever. Are you ready for a redesign and relaunch?